Pete Dards and Ken Gay worked alongside Ken Hardy, with Brian Salt close by. They worked on such subjects as Human Digestion, The History of the Port of London (one wonders how well that compared with Anson Dyer’s version made in the Thirties), Circulation of the Blood, The Magna Carta (for the British Council — running time 40 mins) and a variety of geographical films. The various projections of a map were explained demonstrating the manner in which a flattened grid of the world’s land and sea masses could be derived from a global shape. They were also responsible for many excellent training films. Recruitment had been directed primarily at ex-servicemen and women. Stringer’s new staff were mostly young people. They had all had their first taste of freedom and GBA wasn’t paying them very much, with the result they were difficult to handle. However, Hand was a strong man and he coped valiantly! He would only permit those residing in or around Cookham to live out, everyone else had to live-in, the men in the dormitories and the women in a big country house they called ‘The Haggery’. Even though they could ‘escape’ at the weekends, it imposed a strain on many, especially married personnel. The long period of training for the entertainment cartoon trainees imposed its own pressures. They had to be at their desks by 9 am, and control often broke down both at work and in their leisure moments. Their very high spirits got them banned several times from the local pub ‘The Ferry’. The landlord was very much a ‘Cookham’ type who took exception to these ‘rowdies’ threatening the peaceful tranquillity of his exclusive village. But it was necessary for them to let off steam now and again. The earliest attempts at producing a funny short certainly looked laboured but they had to make a start sometime and there was no better place than in at the deep end. There were teething troubles to be overcome, story lines to be improved, lip synch to be mastered and the characters they created had to be perfected. Les Orris felt that many were shapeless, lacking sufficient understanding of the conception of form. While they poured all their newly acquired skills into the first of the entertainment cartoons, the costs mounted, a fact which did not go unnoticed by their administrators. They had to find a way of spreading the load. Bert Felstead put forward a script and an answer to their problems, and Henry Stringer was given a new assignment. Aerial view of Cookham showing the Causeway out front crossing the Common and the animator’s huts. 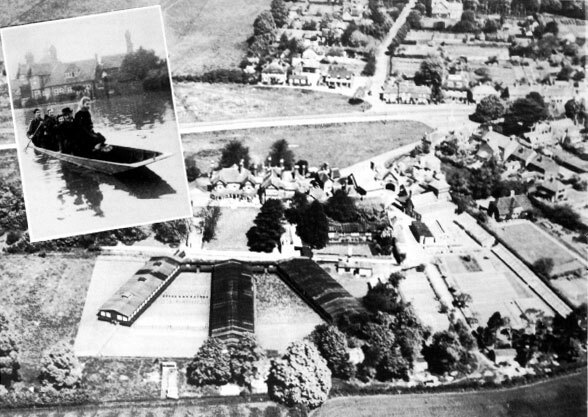 Inset: Floods at Cookham 1947. Just outside Moor Hall gates. Staff arriving for work.